Bitcoin price looks to have found the bottom for  – P3. The triangle I proposed for the wave  correction in my last post turned into a double zig-zag that reached 1826, which is a 55% retrace of the  – P3. Refer to the updated daily chart for the new labels for this count. With the decisive move off of the  – P3 low, it is pretty convincing that there’s still one more wave up for  – P3. Now, waiting for a pullback, or sideways consolidation for wave 2 –  – P3 as an opportunity to catch the next move seems like the best choice for those who may have sold in wave . 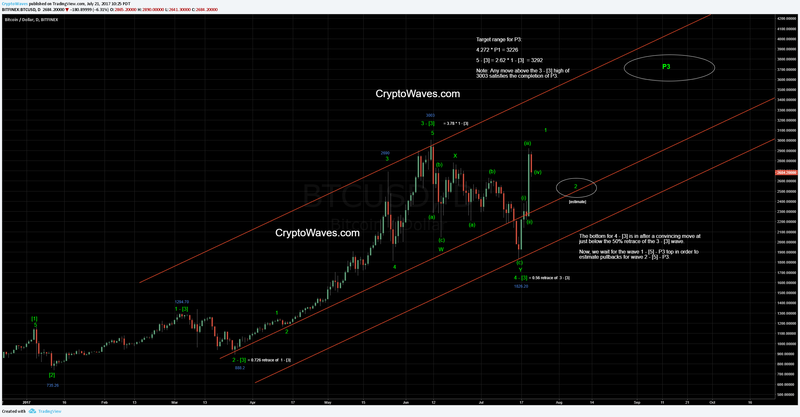 Caution is warranted for bulls if the wave 2 –  correction retraces more than 72.8% of the wave 1 move. Conservative targets for the  – P3 wave are between 3200 and 3300. Wave  can extend upwards without limit though, so tracking the count on lower time frames as it progresses will be important. Wave  also can be complete any time after it passes the previous wave  high at 3003.